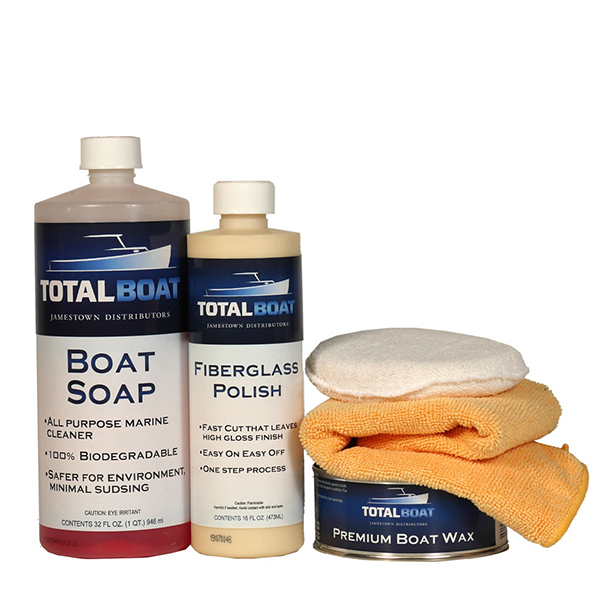 This simple 3 step system includes TotalBoat Soap, Fiberglass Polish, Paste Wax, an applicator pad, and a microfiber towel. It's an unbeatable value, as it comes with everything you need to maintain your boat's finish. This inexpensive, all-in-one kit is an ideal maintenance solution whether you are looking to keep that showroom shine on a new boat, maintain a freshly restored classic, or are simply fastidious about your boat’s appearance. TotalBoat soap is suitable for everything from dishes to sails. Our Fiberglass Polish deals decisively with minor oxidation, scratches, and stains. Follow up with TotalBoat Paste Wax for the trifecta of clean, polished, and protected.